Your options are endless in Olde Naples, where the sun meets the city. If you want to live near the beach, Olde Naples is the place to be – residents here spare no expense to obtain the dream life and dream view they want and deserve. One look at the homes here, and the magnificent view of dolphins and sunsets that can be right in your front yard, you’ll understand why this is one of the most affluent areas in all of Naples. This attractive area gives you that relaxing environment, characterized by the beautiful banyan trees and coconut palms that line along the avenues – all leading to the beach. It is truly a unique neighborhood offering you an extensive and rich history, unmatched views, and the best that city and beach life combined have to offer. An Old Naples home is the perfect place to start building your family or to retire, and enjoy the endless leisure and luxury at your fingertips. Name your specifications and you can find a home that suits even the most particular needs. While some Olde Naples homes feature lake views, the most sought-after properties have unobstructed ocean views with private beach access. While construction in Olde Naples began in the early 1920s, recently modern Tuscan and Mediterranean inspired homes have risen in the area. 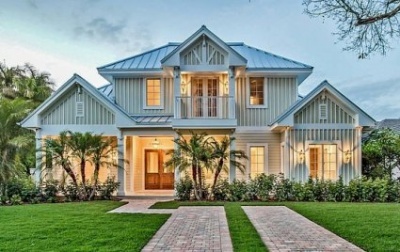 Whether it’s small cottages dating back to the turn of the century for those that like the classic charm, or grand beachfront estates with a contemporary flair, homebuyers a multitude of options. The architecture spans the historical development of the downtown, with Spanish colonial mansions, charming Victorian-era residences, and historic bungalows. Most of the home sizes range from 1,000 square feet for the older style to over 20,000 square feet for a custom built beachfront estate ranging in price from one million to fifteen million. Several of the homes even feature unique Tabbie Mortar construction, naturally occurring local materials of shell, sand, and water used to make hand-made concrete. Olde Naples homes sit in the many different and distinct neighborhoods that embody the authentic feel that makes the city such a great place to live like: the Beachwalk, Golf Drive Estates, Lakeview Terrace, Naples Plan Tier, Olde Westlake Villas, Par La Ville, Rusty Pelican, Spring Lake, and Villas Ravello. There are plenty of real estate choices within these communities starting from old style single-family houses, new construction homes, and villas. Naples zoning does not allow any high-rise condos on the ocean. One prominent section of Olde Naples is Ridge Lake on the northern edge of the community. This neighborhood has less than 150 single-family homes, most of which wrap around two small inland lakes. It is an ideal place where you can walk around or bike to the beautiful beaches. Many people prefer living close to the proximity specifically for the excellent shopping and dining located in the city. Probably the most renowned neighborhood is 5th Avenue South, an elegant shopping area of over 100 fine apparel shops, gift boutiques, and art galleries. Of course, a discussion of 5th Avenue South wouldn’t be complete without mentioning the numerous options available for dining. Whether it’s breakfast, brunch, lunch, afternoon tea, or dinner, there are more than 30 different restaurants to enjoy. Another one of the small and attractive communities similar to 5th Avenue South is 3rd Street South, an area of about 6 square blocks running north to south from Broad Avenue to 14th Avenue South and the border to Aqualane Shores. Walking distance from both of these neighborhoods is Tin City, a restored fishing village turned into a local shopping venue on Gordon River. One of the most appealing aspects of Olde Naples is that every east/west avenue ends at the beach, creating easy walking or biking access for all residents. Thus, it is no surprise that one of the favorite activities of the neighborhood is to go to the beach at dusk to watch another glorious Southwest sunset. In the late afternoons, Olde Naples brings you one of the best sunset views in the world! Outdoor activities in Naples will appeal whether the goal is a leisurely sunrise stroll, pier fishing, deep-sea excursions or a round of golf. Naples calls itself the golf capital of the world, with more than 80 championship courses in the area. Of course, beach activities are premier, with swimming, sunbathing, sailing, kayaking, and fishing among the more popular. Owning a piece of Old Naples real estate can be an excellent asset for savvy homebuyers. For those looking to purchase a home in this exquisite Naples community, you’ll not only have an escape within paradise but will also have the option of renting out the vacation home in one of the most in-demand areas. Olde Naples homes range in size, age and price but no matter what you choose owning a home with an address in this neighborhood is sure to make many of the locals just a little envious. For discrete and professional service, please call me to schedule a private viewing of any of the Olde Naples Home listings. If you would like for me to do all of the research for you, please call me with your search criteria and I will email you all of the listings that you should be considering, and that specifically match your lifestyle requirements. Corey Cabral – 239-963-6590.